Nestled in the Dorset countryside, just 5 minutes from Hardy’s birthplace. There are many walks in the area, the Jurassic Coast is only a few miles away as well as a wealth of gardens, houses, castles and beautiful villages to explore. The Jurassic Coast is England’s first World Heritage Site, ranking it alongside the Grand Canyon and the Great Barrier Reef as one of the natural wonders of the world. The Dinosaur Museum and Dorset County Museum in Dorchester feature displays on the famous coastline and its fossils when you’ve seen it for yourself. The County Museum also boasts the largest collection of Thomas Hardy artefacts in the world and documents his life and work in a special exhibition. The beaches at Charmouth and Lyme Regis are great for a bit of fossil hunting – you might find the next tyrannosaurus rex! Dorset boasts many ancient sites, from Iron Age fortresses to Roman amphitheatres, and don’t miss out on a visit to one of West Dorset’s best known residents, the 180-foot Cerne Giant! There’s also the Tolpuddle Martyrs Museum just east of Dorchester which recreates the tragic story of the six men who attempted to create a trade union for local labourers and were tried and sentenced in 1834 to deportation to Australia. 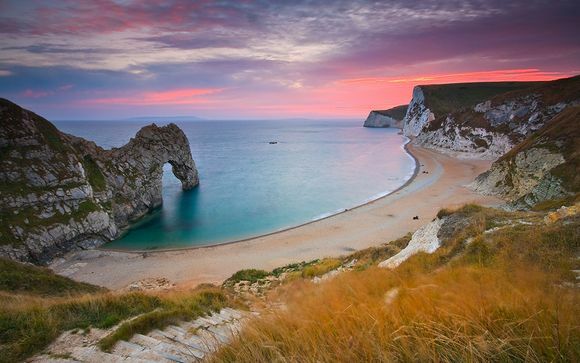 With an abundance of museums, castles, gardens, houses and walks to explore, Dorset is a unique area filled with prehistoric, historical and literary interest. 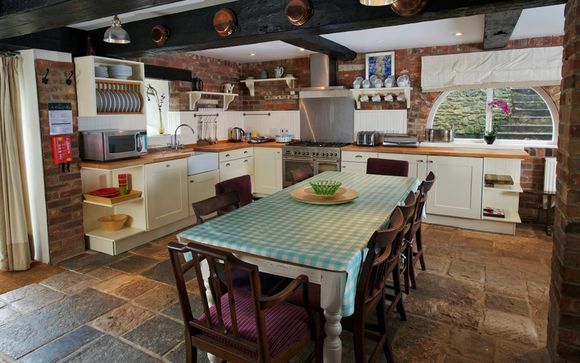 This offer is based on a 4 Bed Cottage. Referred to in Hardy’s poem, The Oxen, this premiere cottage sleeps eight and offers a fantastic variety of accommodation, making it the perfect property for larger families or groups. There is one twin room downstairs with zip link beds and windows and a door opening onto the main courtyard. The downstairs shower room has a modern feel as does the bathroom next door. 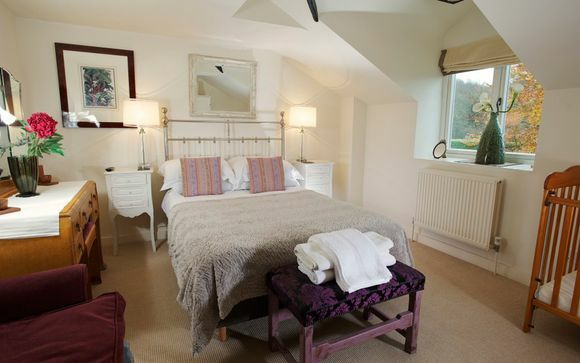 Upstairs the very spacious master bedroom offers a real sense of luxury, with exposed beams, panoramic views across the countryside, a chandelier and a king-sized wooden sleigh bed you just want to jump on! There is an area for relaxing and watching the television by the contemporary electric fire, wardrobe space and designer copper hand wash basin and plenty of space for a cot. The second double room has a wrought iron double bed, TV, space for a cot and wonderful views across the tennis courts to the green fields beyond. The twin room with zip link beds makes a fantastic kids’ room with views into the courtyard. The shower room upstairs has a rain dance shower head and modern fittings throughout. Coomb Barton has a private parking area and its own garden with outdoor seating, table, umbrella and barbecue. Greenwood Grange has a wide variety of onsite activities for all ages to enjoy. The well-equipped games room offers bar billiards, pool, table tennis, table football, a Nintendo Wii and a play area where children can enjoy themselves in a bright, safe environment with wide screen TVs with Freeview. Why not challenge the family to a games competition while you are staying ? For the sports enthusiasts, there are two top-quality tennis courts, badminton, croquet and boules – they have equipment on site or you can bring your own. Greenwood Grange’s indoor 32ft x 16 ft swimming pool is available for all our guests to enjoy and has changing rooms and a coin operated sauna. There is an outdoor children’s play area with swings where our younger guests can use up some of their boundless energy and, if that’s not enough, the giant trampoline should do the trick! Explore nature trails, get up close to living willow constructions, hunt for resident hedgehogs, learn about growing organic home produce in the fruit and vegetable garden and enjoy the natural environment of this exquisite part of Dorset. They are located just off the A35 to the east of Dorchester. Follow the signs for Higher Bockhampton and Hardy’s cottage. Postcode DT2 8QH.